Three-Dimensional Electron Microscopy of Macromolecular Assemblies is the first systematic introduction to single-particle methods of reconstruction. It covers correlation alignment, classification, 3D reconstruction, restoration, and interpretation of the resulting 3D images in macromolecular assemblies. It will be an indispensable resource for newcomers to the field and for all using or adopting these methods. Introduction. 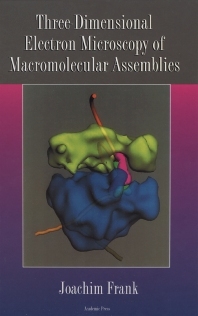 Electron Microscopy of Macromolecular Assemblies. Two-Dimensional Averaging Techniques. Multivariate Statistical Analysis and Classification of Images. Three-Dimensional Reconstruction. Interpretation of Three-Dimensional Images of Macromolecules. Example for an Apllication: Calcium Release Channel. Appendices. Wadsworth Center for Laboratories and Research, State of New York Department of Health, The Governor Nelson A. Rockefeller Empire State Plaza and Department of Biomedical Sciences, State University of New York at Albany, U.S.A.
Wadsworth Center for Laboratories and Reearch, State of New York Department of Health, The Governor Nelson A. Rockefeller Empire State Plaza and State University of New York at Albany, U.S.A.